Welcome to nature at La Roche-en-Ardenne! Not far from the point where Belgium, Luxembourg and Germany meet, you will find the village of La Roche-en-Ardenne, and the campsite of the same name. 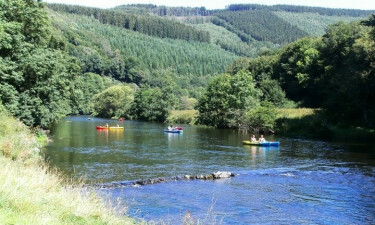 Unspoilt nature and a luxurious camping spot, just a few hours drive from Calais. Book your mobile home at this popular holiday camping in the hills. 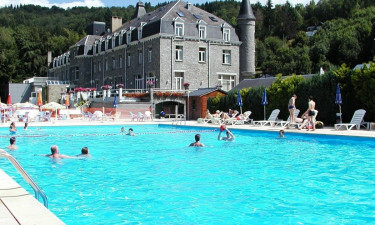 Luxury camping in the Ardennes, why is that a pleasure? It is an area that can still be called unspoiled, and where a holiday means: enjoy. You have the opportunity to do nothing all day long, or to be sporty. Walking, cycling, canoeing, swimming, picturesque old towns, everything is possible here and it is all equally fun. The pool is half a kilometre walk away. There are luxury opportunities on the campsite to relax. Fresh bread and other food is available. There are also newspapers in different languages for sale. The children are entertained in a fun way by the animation team. 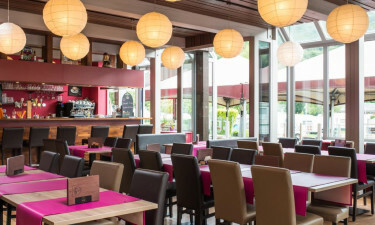 The cozy restaurant "Les Délices de la Vallée" welcomes you. Children are especially welcome, and for them there is very tasty fries. It is the combination of homeliness and class, and all this for a very reasonable price, which makes this luxury camping so pleasant.